People-planet-profit. 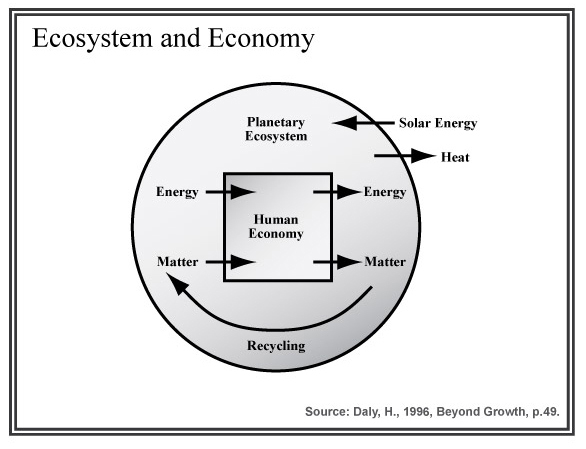 Economy-ecology-equity. Society-economy-environment. 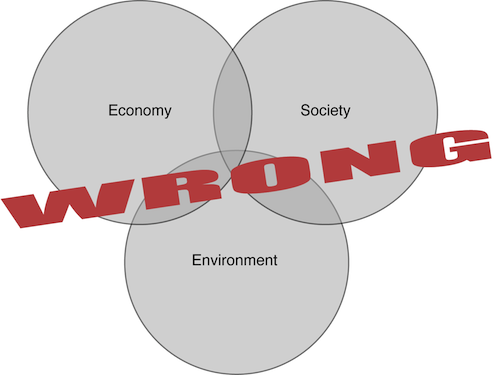 The problem with these “three pillar” sustainability slogans is that they imply an equal weighting, a balance. And, in that balance, meaningful relationships are lost. We all know the real deal: People depend on the planet’s life support systems, and profit only matters as it serves people — so why not develop a more accurate diagram? Last week, in a widely-circulated Nature commentary (“Sustainable development goals for people and planet” sub. req. ), along with a wave of ancillary materials, David Griggs and nine coauthors sought to set these relationships right. They proposed for UN consideration a new definition of sustainable development (“development that meets the needs of the present while safeguarding Earth’s life-support system, on which the welfare of current and future generations depends”) and a set of six Sustainable Development Goals (SDGs): thriving lives and livelihoods, sustainable food security, sustainable water security, universal clean energy, healthy and productive ecosystems, governance for sustainable societies. The evolution of the manuscript of [the 1992 World Bank report] Development and the Environment is revealing. An early draft contained a diagram entitled, “The Relationship Between the Economy and the Environment.” It consisted of a square labeled “economy,” with an arrow coming in labeled “inputs” and an arrow going out labeled “outputs” – nothing more. I suggested that the picture failed to show the environment, and that it would be good to have a large box containing the one depicted, to represent the environment. Then the relation between the environment and the economy would be clear – specifically, that the economy is a subsystem of the environment and depends upon the environment both as a source of raw material inputs and as a “sink” for waste outputs. The next draft included the same diagram and text, but with an unlabeled box drawn around the economy like a picture frame. I commented that the larger box had to be labeled “environment” or else it was merely decorative, and that the text had to explain that the economy is related to the environment as a subsystem within the larger ecosystem and is dependent on it in the ways previously stated. The next draft omitted the diagram altogether. Once you draw the boundary of the environment around the economy, you have said that the economy cannot expand forever (p.7). Since the ecosystem remains constant in scale as the economy grows, it is inevitable that over time the economy becomes larger relative to the containing ecosystem. This transition [might be called] from and “empty world” to a “full world.” The point is that the evolution of the human economy has passed from an era in which man-made capital was the limiting factor in economic development to an era in which remaining natural capital is the limiting factor (p.49). I previously published Daly’s diagram (executed here by Wade Larsen) on P&P and wrote about this story of his in a piece entitled, “The Preanalytic Vision of Herman Daly.” I also updated this article slightly, on the day of posting. 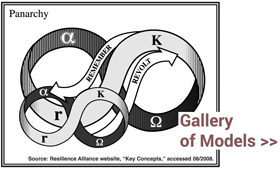 SDGs image: Griggs et al. 2013. 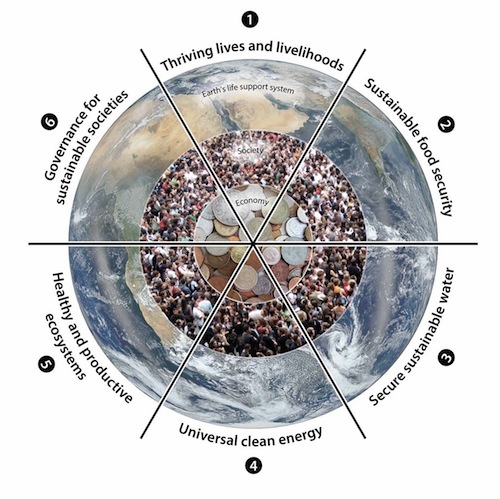 Sustainable Development Goals for people and planet. Nature. That’s a rich compendium by S. Mann. I remember scanning it when i was selecting “representations of sustainability” for the gallery exhibition i wrote about here. Here’s hoping the folks crafting the UN SDGs see the value in this new image.